Why Should You Buy A Toyota Aygo? You go, I go, but it seems plenty of people are going for the Toyota Aygo as their small car of choice in 2017. The Aygo has been on sale in the UK since 2005 - yes, that’s pretty hard to believe for what’s been a precursor to the ‘supermini’ tag which other manufacturers have eagerly rushed to adopt - and models previous to the latest generation clocked up sales of 190,000 in its first 11 years. But things have moved on rapidly - especially in the fast-growing city car sector - and like plenty of other long-lasting models, the Aygo has undergone a number of facelifts - some dramatic, others far more subtle. For the Aygo,Toyota has gone for a bold approach, completely refashioning the car, to the extent that anyone who remembers the original, slightly dumpy but still ahead of its time for the day original car from 2001 would struggle to see any connection. The most recent chapter in the Aygo story was written in January 2017, with the introduction of two new models, which put a sporty slant on the formula of a city car designed to be easy to drive and, above all, supremely reliable. The two new models, christened x-press and x-style, put style at the forefront of their offering, emphasising such niceties as bright red bumpers and rear exhaust diffusers, “plus some top-quality kit features”, as Toyota puts it in its own publicity material. So what are the main selling points of the Toyota Aygo 2017, compared to its predecessors, and how have these changed during the model’s history? That’s what we’ll explore in this article. The Aygo was conceived as a joint venture between Toyota, Peugeot and Citroen, each putting their own twists on the original concept to come up with three separate models - in addition to the Aygo there was the Peugeot 107 and Citroen C1 - and all three made their simultaneous debuts in 2005. This was just as the world was waking to the consequences of global warming, and particularly the effects on it of our motoring habits. So Toyota marketed the Aygo with a bold claim that, if every British motorist swapped their current car for an Aygo, CO2 emissions would be cut by 50 per cent. It was also the first time Toyota had ventured into the city car market, so to some degree it was playing catch-up with the likes of VW and Ford. So while the Aygo certainly made some inroads in that regard, its lower depreciation was largely overlooked by buyers swayed by the fact that both its twin models were cheaper to buy, and offered the same virtues of easy town driving, good fuel economy and generally modest running costs. Autocar’s reviewers make the justifiable point that the original Aygo didn’t suffer so much because it wasn’t a good car in the first place - it was more the case that, in the 10 years of the first model’s lifespan, competitors had cottoned on to its virtues, taken the blueprint and come up with their own models to offer direct competition, in a sector - the city car - which had barely existed back in 2001, when Toyota, Peugeot and Citroen first embarked on their collaboration. This, coupled with many owners’ tarnished memories of model recalls due to a number of electrical issues, is why the new Toyota Aygo had to represent a complete new chapter for the company. When the Aygo became due for a full revamp, the same three manufacturers had quite a lot to lose, so they renewed their collaboration, but essentially Toyota decided it wanted to make sure the new model was easily distinguishable from what had gone before. As a result, if you didn’t know that the model had originally come from a link-up between the world’s biggest car-maker and two of its French competitors, you couldn’t necessarily tell, even if you parked the three equivalent models side-by-side. Rather than the previous soft and rounded look, the Japanese partner in the triumvirate took a more aggressive stance, shaping the whole Aygo concept around an ‘X’ motif. OK, so it’s a major leap of imagination to link a Toyota city car with a Star Wars fighter craft, but the ‘X’ theme runs through the whole range, and has even been adopted for each variant of the new Aygo. So since the launch of the new Toyota Aygo in July 2014, the basic range has consisted of entry model the x, followed by the x-play, x-pression, x-cite and x-clusiv models. Even the entry-level models get LED daytime running lights, USB and auxiliary connectivity, electric front windows and tyre pressure monitoring. The x-play adds air-con, Bluetooth and a rev counter, and the x-pression tops things off with front fog lights, DAB audio, and a rear-view camera. As of early 2017, these were joined by models designated x-press and x-style, both designed to emphasise the interchangeability of many of its cosmetic features, with such touches as an instrument panel which can be specified to match the chosen body colour, along with comfort and safety additions including automatic air-con, and steering wheel-mounted audio and mobile phone controls. Since August 2015, all Aygo models have been available with Toyota’s Safety Sense system, providing a laser-controlled pre-collision system which warns a driver of an imminent collision with a vehicle ahead, and prepares for an emergency brake application as soon as the brake pedal is pressed. Should the driver fail to take action after the warning, the system will initiate Autonomous Emergency Braking to reduce speed by about 19mph, potentially bringing the car to a stop, to prevent a collision or reduce the force of impact. On top of all this, motoring critics have welcomed Toyota’s extensive efforts to damp the ride and inject more feeling into the steering of the Aygo. But some of the best news came on fuel economy, with an Autocar tester impressed with the 63.2mpg he achieved from the one-litre three-cylinder engine - decisively beating the figure turned in by a Hyundai i10 in similar conditions. They recommend that if you’re interested in a Toyota Aygo 2017, you’d be best stretching to an x-pression model, as this includes niceties such as a touchscreen interface, DAB radio, front foglights and alloy wheels. But when you bear in mind that the prime audience for this model is young drivers who might appreciate such features, but also not make the greatest use of them on shorter journeys around town, it’s logical that Toyota puts them on a list of options which buyers can choose if they feel they’re necessary. What most critics are agreed on, though, is that Toyota has tried really hard to make sure that there’s plenty of substance beneath the eye-catching exterior and individual interior options. 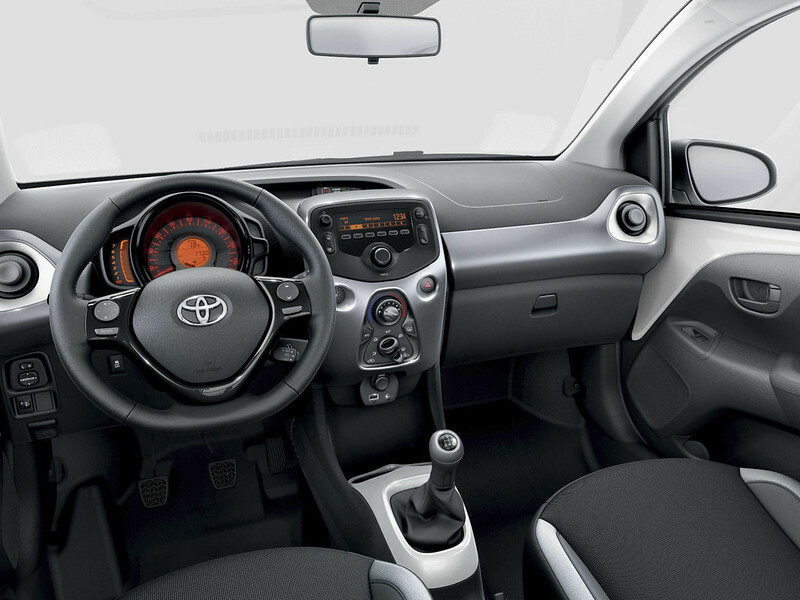 If you’re looking for a Toyota Aygo automatic, you can specify either the x-press or x-style spec models without a gearstick for an extra £700 on top of the £11,935 standard for both models. Meanwhile, the range starts with the x-cite at £11,295. And when you’re putting the a Toyota Aygo 2017 directly up against its rivals, you should always bear in mind that for your money you also get a comprehensive five-year manufacturer’s warranty. That’s two years more than you’d get with many competitors, and if you were to extend some manufacturers’ three-year standard cover up to the same as that offered by Toyota, it’s likely to cost you several hundred pounds - so that makes the price of a Toyota Aygo 2017 very reasonable when pitched against lots of rivals. In fact, time and again from customer reviews, the theme of keen running costs is one of the main things Toyota Aygo automatic and manual buyers alike cite as one of their car’s biggest plus points. When you’re looking for a new, small car, there’s an array of choices out there. But very few of those options have been such a hit over such a long period - and then revamped as successfully - as the Toyota Aygo. And despite its long track record, Toyota’s radical approach to the latest model, even though it has been developed within a common platform, has shown it’s possible to keep a model relevant for a committed group of buyers, while spreading its appeal to a completely new audience. If you’re in the market for a stylish, well-equipped city car, put the Toyota Aygo on your shortlist. Your Oakmere Motor Group franchised Toyota dealer in Northwich will be happy to fill you in on more details, and start to win you over with a test drive. So call and arrange yours today.